The estimated value of the global dairy market is more than 336 billion U.S. dollars. It can become a great market place for your business if you think what you offer can prove as beneficial to this industry. And Blue Mail Media can help you do it better. Our Dairy Foods Email List is the exact resource you need to target the dairy foods industry. This list comprises of companies included in production, distribution, and wholesale of dairy products. These dairy products can be cheese, butter, yogurt, milk, cream, powdered milk, ice cream, and so on. All the contact details in this list are verified using the most trusted and industry-specific sources. To entice more quality prospects and to increase revenue, there is no substitute to an accurate and updated marketing database. Thus, Blue Mail Media brings Dairy Foods Mailing List – the data repository that is highly segmented, verified, and updated. 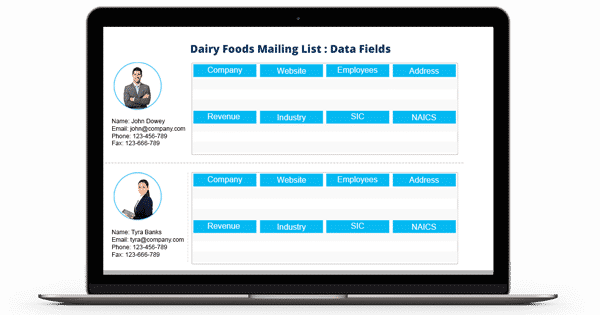 We house a team of data experts that gathers all the contacts in the Dairy Foods Industry Email List by using widely trusted sources such as government records, business directories, seminars, and trade shows. This is a pre-packaged list which you can get customized as per the geographical locations, SIC/NAICS codes, company name, company revenue, etc.